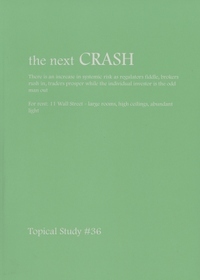 Ticker Sense: Re-Read "the next CRASH"
the next CRASH was written and distributed to Birinyi Associates' clients in August of 2007. In it Mr. Birinyi questioned the rationale behind structural changes such as decimalization, ECNs, and increasingly more complex trading strategies and vehicles. As a result of the essay, Birinyi Associates arrived at the conclusion that "the markets in the first decade of the 21st century are prone to systemic failure as a result of technological innovations and utilization, rapid growth of sophisticated but not necessarily vetted instruments, and other changes in the wide world of finance...We believe the various structural reforms of the 1990s have not achieved the desired effect with regard to the individual." We continue to wonder why nobody is PISSED. These kinds of market gyrations have not occurred since the 1930s, and as much as international financial markets have been disrupted, changes to the structure of the stock market have gone seemingly unnoticed. Specialists and the services provided by the New York Stock Exchange have been removed from the picture causing market anomalies that are detailed in the publication, but have also been highlighted here. What we have witnessed over the last two months is the culmination of flawed and short-sighted complex instruments and theories. Below we highlight some recent charts depicting huge market irregularities that went largely unexplained. Before everything else, allow me to commend your clarity for this subject. I am not saying a professional using this subject, but after studying your article, my under-standing has improved well.